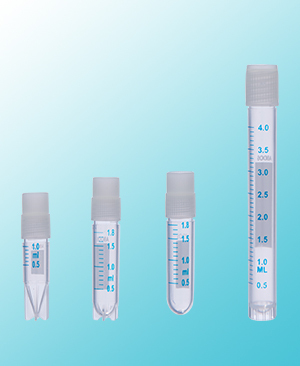 Cryo Vials or also known as cryotubes, are mainly used and intended for storing biological material of humans, plants cells or other organic material. The temperature requirement for preservation or storage of human and plant cells is 130° or lower than that, which can only be attained by liquid nitrogen at -196°. The use of liquid nitrogen is very difficult and can be hazardous as heating can cause outbursts. Cryo Vials, therefore, were introduced as there were no mechanical closing that can be precise and guarantee to be safe under liquid nitrogen. Cryogenic vials, prior to being submerged in gas phase of liquid nitrogen, be checked for its service in advance from the date of sterilization which will be mentioned on the box. Made out of pure virgin polypropylene vials offering high resistance to chemical, low leaching as well as free from TSE/ BSE/ DNase, RNase and Pyrogen. Large white graduation marks are printed on them to make accurate capacity measurements. The unique cap thread of vials prevents over ride of the thread ensuring that it is leak proof and air leak proof. The technological and innovative advancements made in this field of medical has been nothing but a boon, helps in saving time, upgradation to precision and minimizing human efforts to great extent.